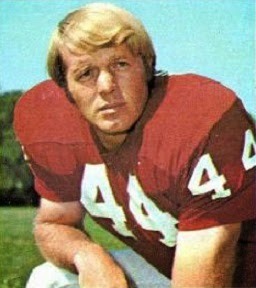 A two-time All-American in college, where he was nicknamed “The Golden Palomino”, Anderson was chosen in the first round of the 1965 NFL draft as a future pick by the Green Bay Packers. Along with FB Jim Grabowski from Illinois, he received a large contract to join the Packers in ’66 with the expectation that he would be the heir to aging star HB Paul Hornung. He saw little action as a rookie but injuries provided an opportunity to contribute in 1967 and he performed well in Green Bay’s drive to a third straight NFL title, also being utilized as a punter and kick returner as well as halfback. In 1968, Anderson rushed for 761 yards and caught 25 passes for 333 more yards to gain selection to the Pro Bowl. Splitting time with Elijah Pitts and Travis Williams in ’69, his production dropped off significantly, but he came back to rush for a career-high 853 yards in 1970 while also catching 36 passes for 414 more yards. Following a 1971 season in which he was joined by rookie FB John Brockington, Anderson was involved in a contract dispute and had other problems with new Head Coach Dan Devine that led to his being traded to the Cardinals in 1972. In his first year in St. Louis, he gained 536 yards on the ground and 298 on 28 pass receptions while also handling the punting (the last year that he would do so). Cardinals went 4-9-1 to finish fourth in the NFC East. Anderson was supplanted at halfback by Terry Metcalf in 1974 and ran the ball just 90 times for 316 yards while catching 15 passes. He was traded to Miami in the offseason but retired during training camp. Overall, he rushed for 4696 yards on 1197 carries (3.9 avg.) and caught 209 passes for 2548 yards, scoring a total of 56 touchdowns. Anderson also averaged 39.6 yards on 387 punts, threw two TD passes on halfback option plays, and ran back one punt for a touchdown.